Today's art/artist rings deep and timely. The above piece illustrates a cause of tremendous topical importance: the protest of the Dakota Access Pipeline. I have not traveled to the site, nor plan to, so I don't feel comfortable writing details about a situation of which I'm not an immediate player. It is, though, important for me to stand up for rights I strongly believe in, like our American right to peaceful protest, and even more so in our human rights to clean water and voices heard. This piece is by Sydney, Australia-based illustrator and graphic designer, Jasmin Meier. Her work incorporates the psychedelic layering of human and natural phenomena reminiscent of 1960's and 70's album artwork. I've always been drawn to that era, namely for its proliferation of the younger generation's pacifist actions in the face of national and international injustice. Seeing Meier's work reminds me that though a world away, I have a kindred spirit out there making beautiful things during turbulent times. 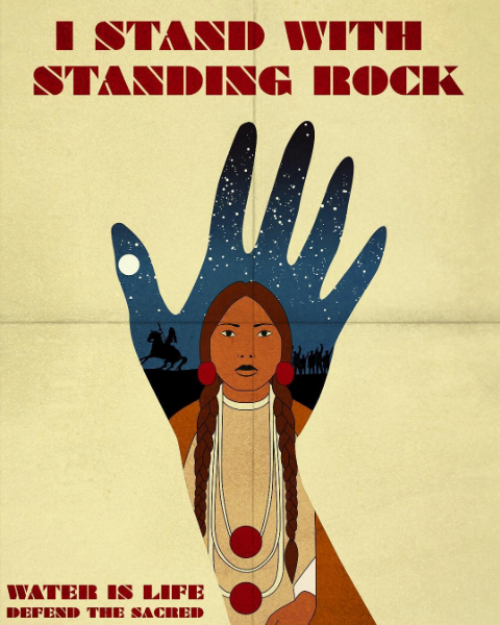 I stand with Standing Rock.